Recent work on time discounting involves hyperbolic discounting, in which the marginal discount rate shrinks over time. This work examines hyperbolic discounting and energy resource allocation utilizing a complex dynamic optimization model of natural gas allocation for British Columbia, Canada. Four hyperbolic and three conventional (constant annual) discount rate paths are considered. Focus is placed on the consequences: of using one hyperbolic discount rate path when another hyperbolic path is appropriate, of using conventional discounting when hyperbolic discounting is appropriate, and of using hyperbolic discounting when conventional discounting is appropriate. The generality and implications of the findings are also considered. Proceedings - On inter- and intra-generational equities in energy-climate policy modelling. Proceedings - Modeling resource use with endogenous time preference and minimum consumption requirement. 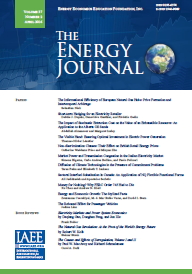 Published in Volume 29, Special Issue of The Quarterly Journal of the IAEE's Energy Economics Education Foundation.